Nepal is a country that has been plagued for centuries by intersectional divides in caste, gender, race, and socioeconomic status. These divides run deep and do not discriminate based on age–thus, children in school experience the pain of cultural exclusion and marginalization from a young age, and Nepal’s education system has suffered from nationwide ills. For example, less than half of Nepalese students will stay in school long enough to reach the lower secondary level, and the gender gap in schooling is enormous: as recently as 2014, it was reported that 71% of men in Nepal were literate, as compared to only 44% of women. To add insult to injury, the April 2015 Nepal quake absolutely devastated the physical and cultural infrastructure of the country’s already suffering education system. Over 6,000 schools were destroyed in the quake and its subsequent aftershocks, leaving educators, students, and their families reeling–luckily, the quake occurred on a day when school was not in session. Although many see this natural disaster as an event that could reverse many years of progress in school attendance, it may also mean something positive for Nepal’s education system. Even just a small improvement in education and literacy rates can do so much for a developing country like Nepal–for example, patients are more likely to seek medical care with just a basic knowledge of biomedicine, and educated citizens spark economic growth and decreases in poverty. Thus, this is a major pivot point in the future of Nepal: because of the utter devastation of the country’s schools and all the work that is currently being done to rebuild the system, this is an opportune time to rebuild and revamp the very backbone of Nepal’s education system, “building back better” than it ever was. Before and after implementation of School Sector Reform Program. Despite the positive trend in enrollment rates across each level of the education system for the past decade or more, this data is deceptively positive when compared to the drop-out rate. UNESCO finds that more than 50% of children will drop out before they reach the lower secondary level of school . Additionally, of the children that remain in school, the Government of Nepal finds that those students from lower castes, primarily janjatis and dalits, drop out more frequently . Programs like SSR are, in effect, targeting this demographic since people of a lower caste are much more likely to attend public schools, or community schools, rather than private, or institutional, schools. Important figures and details about the state of education in Nepal. Nepal’s political history and the government’s recent attempts to address inequity and poor quality in public schools opens the door to further understanding what structures, political and social exist in the country. With this in mind, one can more effectively move forward in the context of a post-quake Nepal. After being plagued by political and social instability for years, the physical devastation laid out before a more stable Nepalese state presents a unique opportunity to reorganize and reinvigorate an education system plagued by poor quality and inequity. With over 24,000 damaged classrooms, the physical infrastructure requires rebuilding quickly and durably. Addressing the physical devastation is a necessary first step, yet it will demand more focused attention to spot those unseen structures that have fallen. Reforming the education system of Nepal is necessary for positive social change and huge improvements for public health in the future. Almost as a rule, the more educated a population is, the better the health outcomes. One’s gender and their place in the caste system greatly determined how much their livelihoods were affected by the quake. Though regardless of one’s position in the community, the earthquake has affected all of Nepal in some way. With this abundance of need and also an abundance of aid waiting to help those in need, resources directed towards getting those children who lost their houses and schools, most likely those in poverty and of a lower caste, will go far. Comparing the urgency of getting kids back in school to a food or medical emergency might seem incongruous, but the longer children who are at the bottom rungs of society are out of school, the farther they fall behind in society and the less certain their future health will be. In this post-disaster period, there have been major efforts to meet immediate needs like food, water, clothing, etc. Schools haven’t received as much attention. While this is obviously understandable, steps need to be taken to plan for the future. These include rebuilding and improving the education system. Nepal is a country with a mountainous terrain. The difficult topography made it hard to access schools even before the earthquake. 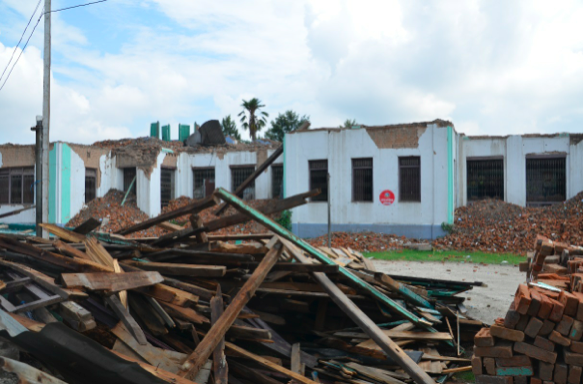 However, in the post-earthquake period it will probably be very difficult to rebuild these schools. The monsoons will further exacerbate these problems and hinder rapid construction of school buildings. 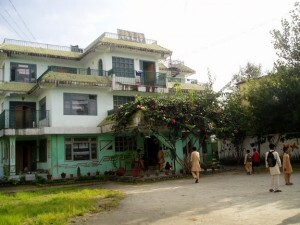 The earthquake can be utilized as an opportunity to improve the Nepali school system. The public education system in Nepal struggles with high dropout rates, lackadaisical teachers, exclusion based on gender, caste etc., and poor resource allocation. Since the educational infrastructure has been reduced to rubble, major changes can be made to reconstruct and improve the system. The temporary learning centers have been constructed with collaborative efforts between schools/communities, the government, and international organizations and NGOs like UNICEF and Save the Children. This could foster beneficial relationships between private and public educational sectors. The collaboration between communities, NGOs, and larger, international organizations like UNICEF could be very useful for quicker relief efforts and future developmental opportunities. Educate the Children “works to improve the lives of women and children in Nepal.” They do this by looking at the education system in Nepal holistically and progressively, honing in on three main areas of focus–children’s education, women’s empowerment, and agricultural development, seeing factors such as nutrition and female leadership as beneficial to standards of living. ETC also places a focus on rural communities in Nepal, mainly those in dalit (“untouchable”) and janjati (ethnic minority) communities, whose women tend to be the most marginalized and the groups as a whole are most likely to face exclusion and poverty. As well as accomplishing some incredible work in Nepal, ETC also has a series of moving and informative photo essays on their website–notably, there is one on schools pre- and post-earthquake. Currently, ETC has put much of their normal work on hold in order to build temporary learning spaces for schools and shelters for families. Room to read is a fascinating organization that looks at education in a very multifaceted and anthropological way, focusing on bottom-up, root causes of inequality and disparities in education rather than the top-down approach of many NGO’s. Their main focus is on literacy and gender equity in education, and they work hard on “scaling with quality,” staying true to the original values of the organization even as they expand to more countries and begin to accomplish more diverse projects. Operations in RTR program countries are run entirely by local staff who are familiar with the local challenges, customs and languages. Additionally, RTR has done some really interesting other things, including putting out the award-winning and widely viewed documentary Girl Rising and writing and printing local-language books. In Nepal specifically, Room to Read has a focus on School Libraries, Reading & Writing Instruction, School Construction, Book Publishing and Girls’ Education. RTR partners with a large number of organizations and institutions in Nepal and has completed over 1,100 school construction projects, built 3,775 libraries, and published over 269 book titles since its birth in 1998. The Global Partnership for Education supports developing countries all over the world “to ensure that every child receives a quality basic education, prioritizing the poorest, most vulnerable and those living in fragile and conflict-affected countries.” GPE sees education as one of the major cruxes upon which many other inequalities rest, and focuses on improving early childhood education in order to create a healthier, kinder, and more just society. They work to create dialogue at the local level, involving stakeholders (called LEGs, or Local Education Groups) in round-table discussions. GPE is also partnered with many larger organizations such as UNICEF, the World Bank, and other local institutions in order to form the connections needed to facilitate lasting change. For Nepal, it is significant that The Global Partnership has a focus on early childhood education, as keeping young children in school is one of the main issues in the Nepali education system. The focus is on increasing access to school and improving quality of school education, particularly basic education (grades 1 to 8), especially for children from marginalized groups. Currently, this main goal is being worked back into the agenda, as much was put on hold after the earthquakes in order to address some of the more urgent needs related to the reconstruction and rehabilitation of schools following the natural disaster. Girl Rising. Dir. Richard Robbins. 2013. This documentary was made in part by the NGO “Room to Read”, which works in part in Nepal. To reach equity, how should the government ensure that all children are given the opportunity to receive an education? Should they subsidize private school for those who can’t afford it? Should they place public schooling even further in the hands of the community and let them decide how to handle the issue? Is the current level of equity in schools sufficient? How do we ensure that the public-private collaborations created during this period are sustainable/can be used for other developmental projects? What should “progress” in education look like? What would be a good measure? Should the government act as a facilitator or an authority for the education system in this uncertain post-quake period? Cannon, R. (2014, April 29). Gender Inequality in Nepal’s Education System. Retrieved August 25, 2015. Harris, G. (2015, May 14). Nepal School System Left Shattered in Aftermath of Quake. Retrieved August 1, 2015. Caddell, Martha (2007). Education and Change: A Historical Perspective on Schooling, Development and the Nepali Nation-State. In: Kumar, Krishna and Oesterheld, Joachim eds. Education and Social Change in South Asia. New Delhi: Orient Longman, pp. 251–284. EFA Assessment Committee. (2000). Education for All: Year 2000 Assessment. Retrieved August 14, 2015. UNESCO Office in Kathmandu. (2012, April 7). High dropout and repetition rates challenge Nepal in Achieving Universal Primary Education by 2015. Retrieved August 15, 2015. Independent Evaluation Group. Project Performance Assessment Report: Community School Support Project. Rep. no. 55407. N.p. : World Bank, 2010. Print. Clark, N. (Ed.). (2013, March 1). Academic Mobility and the Education System of Nepal. Retrieved August 14, 2015. National Planning Commission. (2015). Post-Disaster Needs Assessment (Report No. Vol. B) (National Planning Commission, Author). Kathmandu: Government of Nepal. Nepal Earthquake: Education for nearly 1 million children in jeopardy – UNICEF. (2015, May 7). Retrieved August 1, 2015. Kibesaki, A. (2015, June 25). 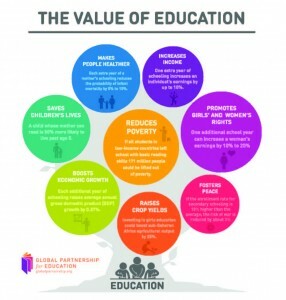 Rebuilding a better education system in Nepal | Global Partnership for Education. Retrieved August 1, 2015. Nepal quake: Damaged schools re-open in Kathmandu – BBC News. (2015, May 31). Retrieved August 1, 2015. “Examples of Inclusive Education: Nepal.” UNICEF South Asia (2003). Retrieved August 1, 2015.